Toyota has started the 'service express' initially aimed to cater the remote locations. The Japanese carmaker will also expand it to bigger cities eventually. The Toyota doorstep service is primarily aimed at remote locations. Toyota 'Service Express' is primarily aimed at remote markets. The company is planning to expand it to bigger cities eventually. Toyota has received positive feedback from remote parts of Rajasthan. 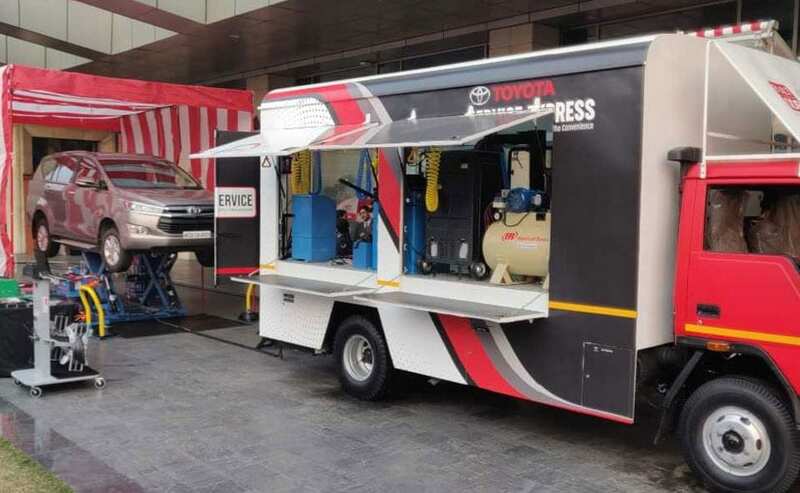 Toyota Kirloskar Motor has launched a new doorstep maintenance service- 'Service Express' which primarily aims at providing periodic service (Minor, Medium and Major) at remote locations where car owners have to travel long distances to locate a dealership. The periodic maintenance service includes Express Maintenance in just an hour, Wheel Balancing, Wheel Alignment and Eco-Car Wash. Toyota is also planning to provide car beautification services and minor body-paint jobs under this easy access servicing experience. Commenting on this new service offering, N. Raja, Deputy Managing Director- Toyota Kirloskar Motor said, "Convenience plays a very important role in providing delightful services and ensuring peace of mind to customers. At Toyota, we always listen to our customers' voice and strive to make our service offerings ever-better, providing easy access to Toyota's car care. Our aim is to limit the constraints of fixed location set-up of car servicing with 'Quick Service' offers at customers' doorsteps, bringing the best-in-class service experience even closer with these 'On-wheels' touch-points." At present, Toyota covers the remote areas of Rajasthan where it claims to have received positive feedback from customers as they now void traveling a long distance to get their cars services. Eventually, Toyota will also expand this service in bigger cities in a bid to save the time of their customers what they spend on taking their cars to the service network.